Recognised as one of the most advanced laser hair therapy devices on the market. It has 40, 7 mW laser diode modules, turned to 650nm. These diodes have glass lenses that provide the most effective prism which light can be transmitted and are the most powerful allowed for a cosmetic device. How can Swiss Care help? 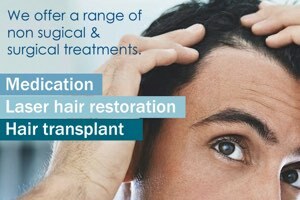 At Swiss Care Hair Loss Clinic, we are only to aware of the emotional and psychological distress that hair loss can cause to suffer us. Often the hardest step is confronting your hair loss. We offer a range of technological advanced hair treatments to help you to restore your hair to its natural fuller, thicker and healthier state. Our highly trained treatment advisors and specialist doctors are ready to assist you in a helpful manner. The laser technology that we use at Swiss Care Clinic is FDA approved in both the USA and the UK as having no side effects. This treatment is based on a lot of factors the best way is to call up and book a free consultation.